Do you want to create your own layered shots like the B-52? You will need to know the density of the liquors you want to use and a specific gravity chart can help. Around the turn of the twentieth century, beautiful pousse-cafes were being created all over the world, especially in Europe. People enjoyed these captivating layers of spirits and syrups in their everyday lives. These layered drinks could get quite extravagant. At times, drinkers would be treated to a pousse glass filled with 10 or more carefully layered ingredients. Sadly, this trend has taken a dive and pousse-cafes are rarely seen today. 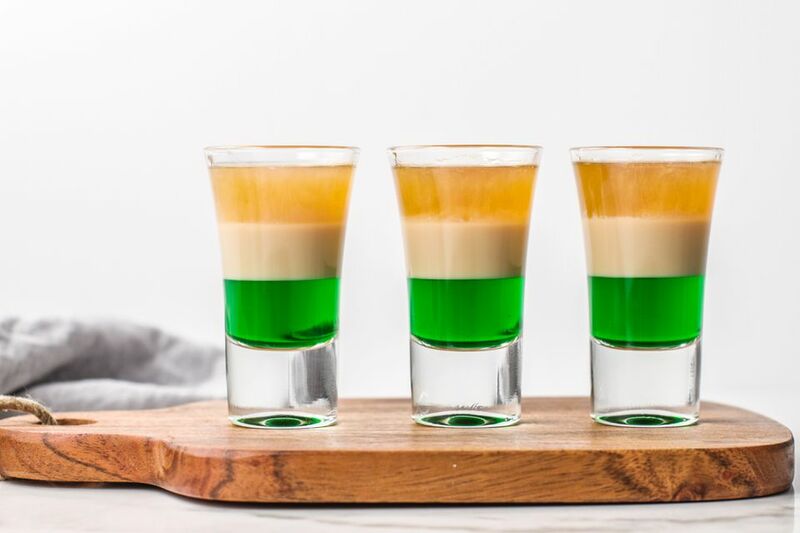 The 1960's and 70's brought the technique back to life in the form of colorful layered shooters like the Irish Flag and B-52. These fun, vivid shots remain a hit at parties and they are a fun way to show off your advanced bartending skills. The key to creating perfectly layered drinks is to pay attention to how heavy each ingredient is. The weight of each liquid is measured by its specific gravity. In the drink world, we compare the density of water (with a specific gravity of 1) to the liquid we are measuring to get its specific gravity. For instance, a thick syrup like grenadine is very heavy and has a specific gravity of 1.18. That is why grenadine sinks when added to a Tequila Sunrise. In order to create a layered drink, the heavier ingredient needs to be added to the glass first. More liquids are added in the order of their weight with the lightest ingredient on top. The best layered drinks are poured over the back of a barspoon to restrict the flow so the ingredients will float. We tend to use general measurements for the specific gravity of various liquors and those are listed in the chart below. This list includes common distilled spirits that are used in layered drinks. They are in order from lightest to heaviest as you work down the list. Keep in mind that brands of the same style of liquor may vary in their specific gravity. For instance, most coffee liqueurs are lighter than Kahlua, which is the most popular brand of that flavor. 0.94 Clear 82.4 proof (higher proof is lighter). 0.94 Clear or Amber Will vary slightly by brand and style. 0.94 Clear or Amber Silver tequilas are slightly lighter than gold tequilas because of the additives in the gold style. 0.94 Amber Includes most whiskies, but will vary based on brand and style. 0.97 Clear Will vary by brand, but this is typical. 1.03 Pale orange Lighter than most orange liqueurs. 1.04 Clear May vary by brand. 1.04 Red Does not include maraschino (see below). 1.04 Clear Malibu Coconut Rum, though others may differ slightly. 1.04 Clear Considerably lighter than other triple secs. The higher proof makes a big difference. 1.04 Dark amber May vary by brand. 1.04 Dark red May vary by brand. Homemade sloe gin will vary as well. 1.05 Creamy light brown Other Irish creams may vary. 1.05 Light green Other melon liqueurs may vary. Marie Brizard Watermelon is the same, but red in color. 1.05 Amber Varies. Hiram Walker is 1.09. Homemade rock & rye will vary greatly. 1.06 Varies Includes most apricot (amber), blackberry (dark purple, cherry (dark red), and peach (amber) brandies. 1.06 Pale yellow Will vary greatly by brand, some may be considerably heavier. 1.06 Pale orange Higher proof peach schnapps (90+) will be lighter (approx. 1.04) than this, which is standard for a 30-proof. 1.07 Pale amber B&B is 1.02. 1.08 Orange May vary by brand. 1.08 Brown Will vary by brand, this is typical for 30-proof. Higher proof schnapps will be lighter. 1.09 Bright amber May vary by brand. 1.09 Clear May vary by brand. Sambuca comes in many colors, including black green, red, gold and white. 1.09 Brown Lighter than most coffee liqueurs, especially Kahlua (see below). 1.10 Dark purple May vary by brand. 1.10 Blue May vary by brand. 1.10 Clear May vary by brand. 1.12 Yellow May vary by brand. Most are between this and crème de banane (see below). 1.12 Green May vary by brand. 1.12 Clear May vary by brand. 1.12 Bright red May vary by brand. 1.14 Brown Most brands though Kahlua is heavier (see below). 1.14 Brown May vary by brand. 1.14 Clear May vary by brand. 1.16 Amber May vary by brand. 1.16 Bright red May vary by brand. 1.17 Clear May vary by brand. 1.18 Bright yellow May vary by brand. 1.18 Dark purple May vary by brand. 1.18 Bright red Homemade grenadines may vary. 1.22 Golden May vary by brand. If you are interested in specifics, the best chart I have found is in Gary Regan's The Joy of Mixology book. In it, he lists specific flavors from most of the popular liqueur producers, including Hiram Walker, Marie Brizard and DuBouchett. The more sugar a liquor has, the heavier it will be. Syrups and heavy liqueurs are considerably heavier than whiskey, rum and vodka, which contain no sugar additives. The higher the proof, the lighter the liquor is. This is a generalization, but orange liqueurs are a good example. Notice that in the chart, the 80-proof Cointreau and Grand Marnier liqueurs are considerably lighter than the average triple sec or blue curacao. The same can be said for high-proof peppermint and peach schnapps. Choose layers with a big difference between them. As a rule of thumb, the greater the difference in specific gravities between two layers, the easier it is to keep those layers from mixing into one another. Use these tips to create your own custom shots and have fun playing with the color and flavor combinations that are available.